The problem is that I've got a position which is clearly bi-allelic in IGV and that is said to have only the reference allele in the gVCF I'm generating with HaplotypeCaller. The variant of interest is located 19bp away from the captured region but with "-ip 50" it should be detected. To check what is really analyzed, I output the bamout for all analyzed regions (-L PATH/merged.bed, -ip 50) and saw that the location of the variant is not analyzed (If I'm correct: as there is no coverage, this is not an active region). * merged.bed is the file used with the -L option. Finally, I tried to call variants changing the -ip option to 100 and got the alternate allele called. If I manually add/subtract 50bp to the closest target region boundaries, I've got the same result as with -ip 50. If I manually add/subtract 100bp to the closest target region boundaries, I've got the same result as with -ip 100. I tried several versions of GATK (3.46, 3.7, 4.0.4.0) and always got the same results. I may have miss something but so far I can't explain myself what's happening. Do you see any explanation for what I observe? Do you see any options I should use to overcome this? This problem is issued in github as a bug and still not fixed. 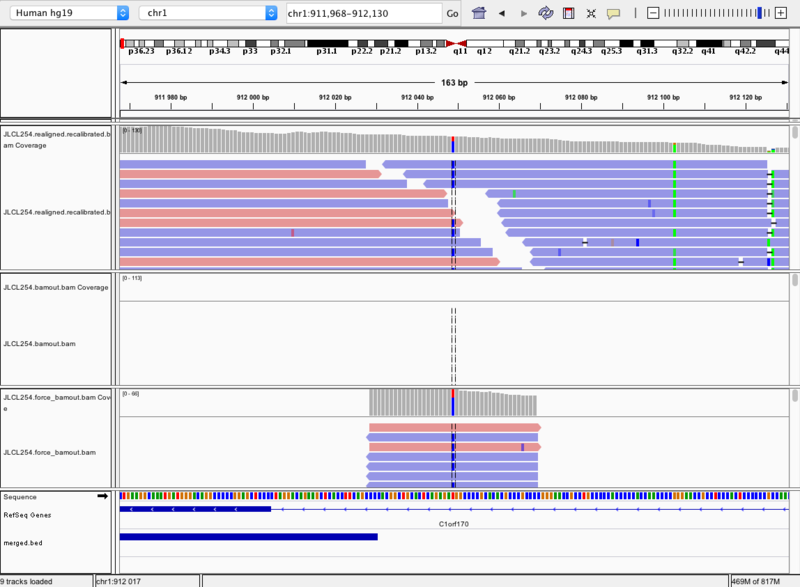 As a workaround @shlee proposed to run exomes without bed files in HC and filter variants based on bed later on. I am trying to find out my samples to represent this problem but it seems they have gone with the wind and they are somewhere in my piles of archived sequences. Once I find them I will test this proposed solution. Thanks for your answer! I'll do like this then.